Welcome to Precision Builders Otago. We will work together providing you with a building solution that will ensure your building project is completed as you want it, hassle free and within the budget you can affordable. 1. Do you want to feel in control of your New Home or renovation as it evolves? 2. Are you fed up with builders who promise but don’t deliver? 3. Do you expect your property to be cared for, and left as you’d leave it? 4. Do you value the creative know-how of an experienced builder, friendly, local team? 5. Do you want a range of affordable options, rather than “one size fits all”…? If you answered “Yes” to any of the above, no matter the size of your, renovation, addition, maintenance or fully customised new home talk to us at Precision Builders or call on 0800489463. It will be the best decision you make. Managing a RENOVATION or NEW HOME build is not a challenge to take on lightly, if you want things to run smoothly with a successful outcome. Some people can manage a building project themselves with good results. It can be very satisfying. On the downside, managing the project yourself is a huge commitment which will cost you time, may impact on your own work or business, and put stress on your family. There are hundreds of decisions to be made and that’s before you even start to build. During the build you need to organise and manage health and safety compliance, insurance, site management, time lines, Meet milestones, progress payments, quality control, keep a hold on the budget, lead times for delivery to be considered, co-ordination of sub contractors to ensure they turn up when needed, trouble shooting for the unforeseen, wet weather effecting progress, short orders or damaged delivery, rescheduling, variations, local authority inspections. Then just when you think you have it nailed arranging all the compliance documents, engineers reports, producer statements and sign off’s all required for code of compliance. After the build ensure all warranties are logged and the list goes on. There is so many things to consider how do you keep it together? Did you know 75% of builds fail! That’s right research shows 75% of builds fail for one reason or another. They run over budget, over time, poor quality assurance, poor management, scope of works not met or just not happy with the whole process and some don’t get finish at all! Everyone has heard the horror stories being in the dark overwhelmed with choices never really knowing where the financials are or what’s going on. Often with a he said she said stand-offs for variation and selections with the fun just getting sucked right out of what should be a happy and exciting time. The end result, although the home is built, are memories of disappointments and compromises rather than excitement of moving in to your new home enjoying the fruits of your ideas being turned into a reality. It happens all the time but it doesn’t have to be that way! Be the 25% that are successful and happy with their build. Ever since I was 13 years old helping my father rebuild a shed that burnt down on the farm we lived on I knew I wanted to be a builder. During my journey in becoming a builder I watched many builds completed with mixed emotions for the clients. I thought to my self there must be a better way and set out to find the solution. State of the art technology to manage your building project. Want to know the secret to success no other builder can provide? Together with our dedicated passionate team of builders and network of quality trades people we will build your New Home “Precisely” as you envisage it with an easy transparent process, on time within budget with a happy handover you will remember for a life time. The team look forward to building a happy relationship taking the journey with you to Your New Home enjoying the fruits of your ideas being turned into a reality. Home Renovation Tips to Improve the Value and feel of Your Home. The word RENOVATIONS can mean different things to different people. ADDITIONS (adding a new room), new KITCHEN BATHROOM or simply changing the paint colour can be a great way to increase the value and improve the space in your home. Often significant value can be added to a property through relatively minor changes. However get it wrong and spend money in the wrong places can easily see you over capitalize potentially loosing money if you sell however this isn’t a problem if you intend on staying and want to improve your comfort and living space. Here’s a few renovation tips that will add value to your home. 1. Insulate! The value this adds to your home cannot be overstated. Although it is hidden it can be felt and makes a big difference during those cooler months. When renovating take advantage whilst the linings are off to fit insulation, in fact not having insulation can easily create the perception of an unhealthy home. Not only is it a good idea to do the outside walls and ceiling, consider internal walls also. Isolating the heat to that room, sound proofing and in the summer helps keep the house cool. A win win all round and always a positive when selling but also remember this will keep heating costs down because the insulation will keep the heat where it should be, in your home! 2. Decks If you have the room adding or renovating your existing deck is one of the simplest ways to increase the value of your property. A deck is a great way to create the much-desired ‘indoor-outdoor flow’ creating open plan living. They’re also great for entertaining and can be closed in with clear screens to be enjoyed all your round. This adds a great asset if you are selling your home and provides excellent value to your living space. 3. Fit a New Kitchen We spend a lot of time in the kitchen, cooking entertaining or just hanging around. A tidy, modern looking kitchen can seriously improve the value and life style of our home. When it comes to updating there are two options: replace or face lift. The state of your current kitchen, budget and end goal will determine which is the right option for you. Whether your looking to replace the kitchen or give it a face lift with new door and draw fronts and/or bench top, these items are noticed more than most people realize and new or cleaned handles can make a big difference at little cost. One addition to your kitchen that can really bring a modern feel is a Glass splash back. It has a very clean look and can be custom made to suit the area and colour. 5. Street appeal Some people still think street appeal is what sells a house and provides a warm welcome home but looks can be skin deep with hidden gems inside. The street may be the south side of the home, Lay of the section may not lend it to having good street appeal, views from the property etc all effect this area. That said, as they saying goes, first impressions last; creating street appeal, or a desirable entryway, is one of the best ways to add value or help sell your home. A prospective buyers first impression of the property is often the one that sticks and a little can go a long way in this area of the property. Clean lines neat and tidy appearance is what counts. Keeping any garden or lawn trimmed and neat, adding plants to the front of the home can really liven it up. Painting the entrance way is one of the best ways to blow the cobwebs off the front of the house. 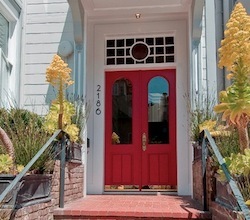 Painting the entrance door a bold colour can really make your house stand out, but keep it within the trending colours. Renovations are something that cannot be undertaken without some serious planning. If your planning a bathroom kitchen or major renovation then engaging a project manager to over see the work or a contractor that includes this is their services is the best way to ensure your budget and time frames are met. see our post ……….Hopefully these tips will serve as a great starting point for those of you wanting to add value to your property or just improve your living space. Left a Bit… …now was that metres or yards…? On target: The 50.5km Channel Tunnel linking England and France took just two years to dig using 11 tunnel boring machines each the length of two football pitches (200m). Despite digging from two different sides, on December 1, 1990 a French and Englishman shook hands through a hole connecting the two tunnel ends, having met within just 5-15cm of tolerance, 100m beneath the middle of the sea. From concept to completion, Precision Builders can help you through every stage of building your dream home. We take pride in keeping abreast of the latest design and building innovations, and applying that knowledge to your project. From cracked vanities to brand new wet-rooms, Precision Builders are your bathroom masters.